(Newser) – A California police officer who was killed in the line of duty was hailed Saturday as a "Fiji-born American hero" who made the ultimate sacrifice for his adopted country, the AP reports. At a funeral held for Cpl. 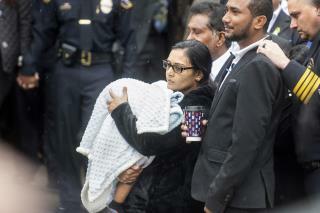 Ronil (row-neel) Singh, mourners remembered the 33-year-old as a hard-working immigrant who worked his way up to become an officer in the small town of Newman. He "stood so much for what is right in our world and yet unfortunately was taken too soon from us by what is wrong in our world," Modesto police Officer Jeff Harmon said at the service in a Modesto church. He "probably more than anything else wanted to be home on Christmas night with his wife and his young son, but instead made a selfless choice to serve all of his community knowing that there are many more than just his own family that needed his protection that night." The anti America commie house members had ought to give Trump the money for the wall before they really get him pi$$ed off. He means what he says about his keeping the government shut down---he wants the fuh-eh*kng money---give it to him to build the wall, dammit so the government can open back up. In the utter silence from democrats on this heartbreaking event, one can only assume their sympathies lie with the illegal murderer and not the legal immigrant who came to this country to realize his dream of becoming a policeman.